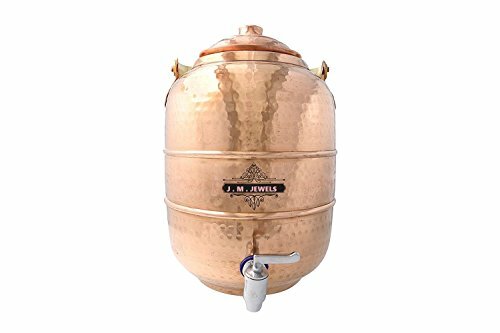 Introducing J M JEWELS pure copper water storage container. Our products are made of superior grade copper. Ayurveda recommends storing water overnight in a copper vessel and drinking it first thing in the morning for maintaining good health.The metal copper has electromagnetic energy which is called Prana Shakti. Drinking water that is stored for 8-10 hours in a copper vessel is very beneficial. Copper makes the water ionic which helps to maintain body's pH (acid-alkaline) balance. Care instructions-It has wide mouth thus extremely easy to clean. Just rinse with lemon water or Vinegar. Tarnishing is a naturally occurring process that happens when copper reacts with outside elements, such as oxygen, moisture or human touch If tarnishing occurs, you simply need to apply citric acid (lime/lemon juice) and salt (acts as the catalyst for the citric acid) to the mug, and the tarnish will remove very easily. HEALTH BENEFITS - Prevents Water-Borne Diseases. Copper very effectively destroys many bacteria that cause water-borne diseases. Keeps the Digestive System Healthy. Aids Weight Loss. Promotes Healthy Skin. Beats Anemia. MADE IN INDIA \ SELL GLOBAL: Artisan Crafted Handmade metal ware is made by skilled craftsmen in India. If you have any questions about this product by J M JEWELS, contact us by completing and submitting the form below. If you are looking for a specif part number, please include it with your message.